Model a PCR reaction and see your PCR product in Benchling. Create primers on Benchling either manually or using the Primer Wizard. Open your sequence and open the Primer panel on the right nav bar. Link the primer pair that you'd like to use in your PCR reaction. To link two primers as a pair, use CTRL or SHIFT to select your two primers from the panel and click Link Primers. Note: If you created primer pairs using the Wizard, they will automatically be linked. 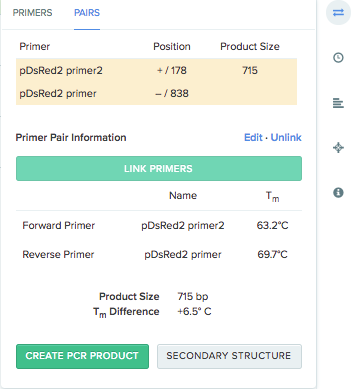 Next, click on the Pairs tab on the Primers panel, select your Primer pair, and then select Create PCR Product. Set your desired options on the next screen; these will help determine what your new sequence looks like in Benchling. Click Copy to save the final PCR product/sequence to a project and folder.